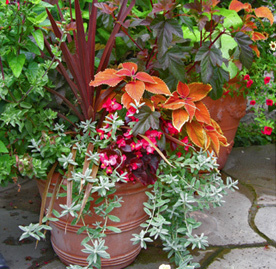 Seasonal containers are one of our specialties—and a practically effortless way to keep your garden new and exciting! Arranged singly or in groups, they provide year-round vibrance that can be appreciated from indoors and out. Container gardening works for all plant types: trees, shrubs, ornamentals and edibles and they will thrive in even the smallest outdoor spaces. Your containers can be changed annually or seasonally, and they’re a cost-effective way to enliven your entrance, deck, patio and window ledges. They also make terrific gifts! Change your pots quarterly. Incorporate them into existing garden beds to transform your landscape. You can ask us to custom design your seasonal containers or choose from a number of harmonious designs we’ve already developed.